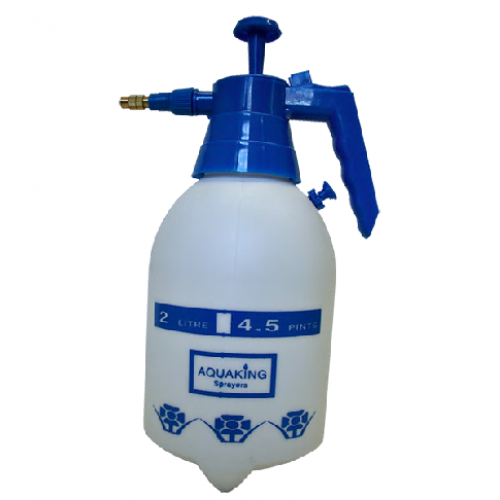 An 2 Litre Aqua king Compression Sprayer eliminates much of the work associated with the application of pest control substances to plants and other living greenery. The sprayer boasts a convenient capacity of 2 litres. The Aqua king Compression Sprayer is a quality asset for large or oversized grow spaces without issue. The spray bottle is user friendly, which makes it possible for almost anyone to use effectively. The top portion of the container detaches to allow users to easily fill and mix pest control substances and feeds without utilizing an additional container. Adjustable nozzle options include jet-spray, fine-spray and all speeds between. Once at the fill-line, continuously lift and press the plunger in an up-down motion. This permits pressure to build-up inside. Exercise caution to prevent extra pressure from developing inside. Pressing the trigger allows liquid to fill the supply tube and emits to the nozzle and emit from the spraying lance. If spraying large areas, slide the blue trigger to lock it in and it stays in position for easy emission of content. Place the container on the shoulder using comfortable strap and decrease the time of the job without decreasing the effectiveness of the outcome. As noted above, the compression sprayer is convenient and very easy to use. Keep the components around spray nozzle clean and free of debris. Be sure to eliminate the accumulation of pressure during use of the container. Make the job simpler by adjusting the knob to align with the type of coverage desired when applying substances to the grow area. Aim directly at the plants, press the trigger to release the contents of the container to cover the plants with the substance. The Aqua king Compression Sprayer is designed for personal or commercial use. It is designed to perform tasks of any size without diminishing the quality of the outcome.